Pilosio shoring systems ... in use at the Prophet’s Mosque. Pilosio said its shoring and formwork produced in the Italian province of Udine are being employed in the biggest-ever project for the company in terms of size and value. “This contract covers just the first phase of Madinah Haram expansion, and we will continue to play a significant role until at least 2020,” said Dario Roustayan, CEO of Pilosio. As part of Phase One that will conclude at end of this year, the Italian company is currently supplying its flagship shoring structures made with the MP multidirectional system and type P300 formwork to execute works covering 20,000 sq m of the basement area of the mega structure which extends to a depth of -15.08 m and whose total floor area measures about 650,000 sq m.
Pilosio’s total share of work in the entire project covers a total surface area of 400,000 sq m.
The expansion work on the 2-million-sq-m mosque, which can accommodate 1.2 million pilgrims, includes the development of related infrastructure, transport networks and buildings surrounding the structure known as Al Ruwaq. Pilosio said it won the contract having met the expectations of the client, particularly in terms of assembling and dismantling as well as the handling of the shoring systems in order to ensure optimal management in all phases of the construction, while limiting costs and ensuring the equipment could be reutilised over several stages, said the company. Numerous feasibility studies were conducted to arrive at the best solution, Pilosio said, in addition to training courses at various levels as well as construction of on-site mock-ups that demonstrated the pre-assembly of the shoring structures. An MP multidirectional system was decided upon as the shoring equipment for casting the ground floor slab and the one below extending to a depth of -5.15 m, due to its greater flexibility when installed in areas with site access restrictions and where foundations are at different levels. For reshoring the slab at ground level, which required the transfer of the load of the slab to the pile-driven foundations at -15.8, Pilosio foresees the use of the MP multidirectional system with heavy-duty MP towers. The new MP heavy-duty tower is achieved by coupling and connecting the 16 uprights for each column of the tower with standard elements, to reach the minimum capacity rate required (reaching 600 kN per column). 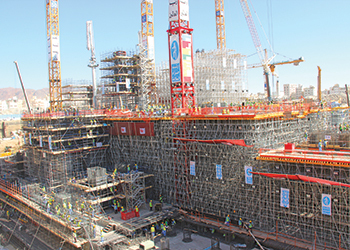 Each individual MP tower has been “designed” to be divisible into at least two parts in height, where the upper part can be removed, leaving the lower section of the tower which is the support system in place for casting of the second slab at level -5.15m. The MP towers can either be built up in-situ or in a specified area (of the site), in which case they can be moved and placed in their final positions by on-site cranes. Once the casting has been completed, the towers can be dismantled in-situ or relocated individually or in groups to adjacent areas. The removal of the towers takes place with a system of wheels fixed to the base of the four columns of the tower, enabling fast transfer of the shoring system. To contain the casting of the 3-m-high drop beams present in the two floors, standard P300 formwork has been opted for, supported directly on the MP towers.